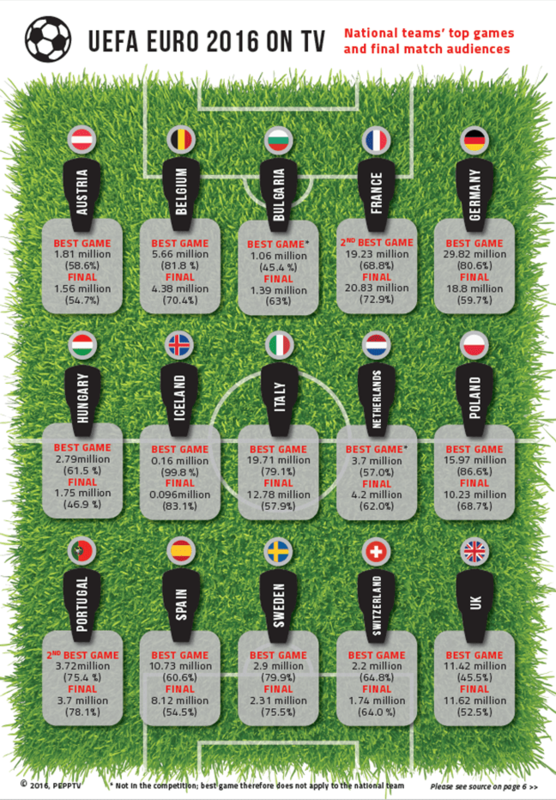 Euro 2016 beat viewership records throughout Europe. Unsurprisingly, new records for the most-watched TV programme have been set in France and Portugal, the countries that made it to the final, but also in nations such as Poland and Iceland. Data from European broadcasters suggests that the majority of streams on broadcasters’ websites were to catch-up and replay services that enabled fans to enjoy highlights from previous games. “Euro 2016 once again proved the power of live TV, its capacity to bring people together and its emotional impact across generations,” noted Katty Roberfroid, director general of egta, the European association of television and radio sales houses. 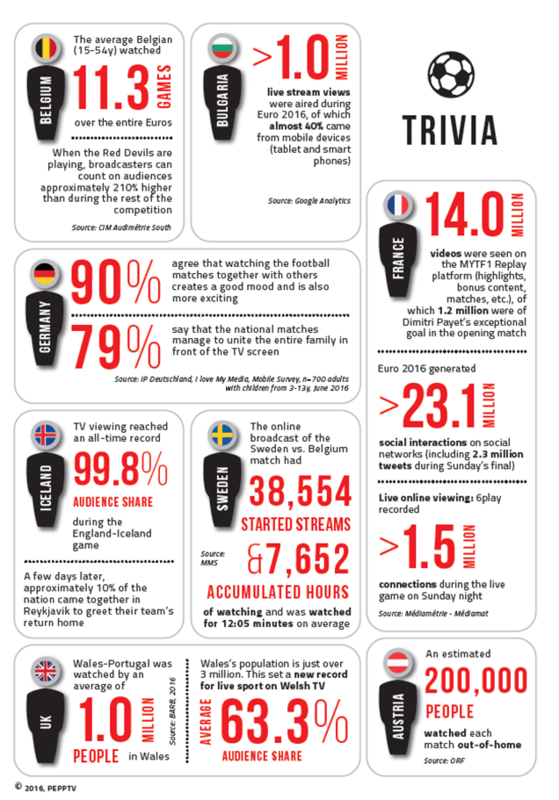 In Austria, the national team’s game against Portugal gathered 1.81 million fans in front of their TV screens. The audience share shows the enthusiasm created by the Wunderteam with 58.6% for the total population and 71.1% for the younger generation (14-29). Similarly, the final attracted 1.56 million viewers (54.7% audience share for the total population and 62.1% for 14-29). In Belgium, the Red Devils were supported in their game against Hungary by 81.8% of the viewers (5.66 million fans); a number even more impressive for the young target group 15-34: 88.5%. The final gathered 70.4% of 4+ viewers and 73.1% of 15-34s, i.e. 4.38 million people. In Bulgaria, despite the absence of the national team in the competition, the France-Germany game gathered 3.1 million viewers (45.4% audience share among 4+ viewers), while 4.3 million viewers watched the final (63% audience share of 4+ viewers). In France, the game of Les Bleus against Germany gathered 19.23 million fans in front of their TV screens, with an audience share of 68.8% for 4+ and an impressive 85.8% for the 15-24 demographic. Unsurprisingly, the final beat historical records for the broadcaster that aired the game, which included the championship in its schedule for the first time, with 20.82 million viewers and a 72.9% audience share (85.7% for 15-24). In Finland, despite the national team The Eagle Owls being absent from the competition, 73% of viewers watched the final. The figure is even more impressive among the young population, where 87% of 15-34s watched the game either live or on catch-up online. In Germany, an average of 29.82 million fans watched La Mannschaft play against France (80.6% audience share for 3+ and 89.2% for 14-29). The final game France-Portugal further attracted an average of 18.8 million Germans in front of their TVs, with an audience share of 59.7% for the total population and 64.6% for 14-29s. In Hungary, the National Eleven gathered 61.5% of viewers (2.8 million) for their game against Belgium (and 69.8% for the 13-29s) while 46.9% watched Portugal win Sunday’s final, i.e. 1.75 million viewers. In Italy, the game of the national team against Germany saw 19.7 million fans gather in front of their TV screens (79.1% audience share). Despite the absence of the Squadra Azzura in the final, the game attracted 12.78 million fans (57.9% of total viewers and 71.4% of men). The championship overall achieved an 42.9% average share, equalling 9.6 million viewers. In Iceland, the game of the national team against England gathered 162,000 fans in front of their TV screens and beat an all-time record for a sporting event in Iceland and worldwide of 99.8% audience share of TV viewing. Despite the absence of The Boys, 96,000 people watched the final (83.1% share of TV viewing on the channel Sjonvarp Simans). In Poland, 15.97 million viewers tuned into the Poland-Portugal game (86.6% share). It is worth noting the extraordinary share of 90.85% for the young target group 14-29. Similarly, for the final game, 10.23 million fans watched the game (68.7% for the total individuals and 72.21% for the 14-29 target group). The result of last game of the Polish team (Poland-Portugal) was a record one in the history of the telemetric survey in Poland. In Russia, despite the time difference, 5.61 million fans watched the Russia-Wales game. The final was seen by 5.46 million Russians (with an audience share of 41.4% for the young 16-30 target group). Spain’s game against Croatia gathered 10.73 million fans in front of their TV screens (60.6%). The audience share shows the enthusiasm created by The Red Fury, with 60.6% of the total population and an impressive 70.8% of 15-29s tuning in. Despite the absence of the national team, the final also performed well with 8.12 million viewers (54.5% audience share for the total population and 59.3% for 15-29s). In Slovenia, 346,922 viewers, representing a 57.6% audience share, watched the Portuguese victory over France in the final. Among younger viewers (15-29s), the game was even more popular, taking a 69.1% audience share. In Sweden, the national team’s game against Belgium attracted 2.9 million fans in front of their TV screens to watch the Blågult (Blue-Yellow) team. 79.9% of the total viewing population and an impressive 88.5% of the younger generation (15-39) watched the match. Similarly, 2.31 million viewers watched the final (75.5% audience share for the total population and 83.7% for the 15-39s). In The Netherlands, despite the absence of the Oranje in the competition, the France-Germany game attracted 3.7 million viewers (57% audience share), including an impressive share of 66% among young people (13-34). The final also gathered large audiences: 2 million viewers (62% audience share), including 972,000 youngsters (69% audience share). It is also worth noting that the national broadcaster’s online platform counted 25,063 stream starts during the final game. In the United Kingdom, England’s game against Iceland peaked at 17.13 million, an audience share of 45.5%, while the final peaked at 15.76 million, a share of 52.5%. In Switzerland, where three language regions coexist, 2.2 million Swiss fans watched the Nati play against France. The audience share was equally impressive in all regions (64.8% in the German speaking part, 66.3% in the French speaking part and 60.2% in the Italian speaking part). The final attracted 1.7 million viewers (with a great audience share in the German speaking part of 64% for 3+ and 69% for the younger generation of 15-29s). In Portugal, 3.72 million viewers, including almost 340,000 youngsters aged 15-24, watched Portugal beat Wales (75.4% audience share). The final game against France similarly gathered 3.7 million viewers and a 78.1% audience share (79.9% for the 15-24 target group). Even in Canada, despite the time difference and the European focus, the competition gathered huge numbers of fans in front of the TV screen: the Germany-Italy game attracted 1.55 million fans, with a substantial 40% audience share for the 18-34 target group. The final was watched by an even more impressive 2.33 million Canadians (audience share 2+ of 30.6% and young target group 18-34 of 42.6%).